A Pinal County sheriff’s sergeant is discussing Deputy Louie Puroll, who famously claimed on April 30 that a Latino drug smuggler shot him in the desert. ”I can’t speak for our sheriff [Paul Babeu],” Dave Hausman says, “but I can speak for our unit, and the sheriff can slap me later if need be. ”But I think there’s a lot of confusion that [Arizona Senate Bill] 1070 and what happened to Louie Puroll are intimately related. What happened out in [the] Vekol Valley was a criminal enterprise. Louie was looking at guys carrying drugs, whether they were illegal immigrants, citizens of the United States, or, in the darkest of dark realms, dirty cops or bad firemen. Hausman, an 18-year veteran of the south-central Arizona sheriff’s office, supervised his agency’s criminal investigation of the shooting. The case thrust Pinal County Sheriff Paul Babeu into the national spotlight as a ubiquitous naysayer on the subject of the federal government and undocumented aliens, and it further polarized a citizenry already splintered by the illegal immigration issue. The incident happened a week after Governor Jan Brewer signed S.B. 1070, Arizona’s contentious anti-immigration law, and a month after Cochise County rancher Rob Krentz was gunned down on his cattle ranch, possibly by an illegal alien, in a still-unsolved murder (“Cowboy Down,” June 10). Deputy Puroll told investigators he was on a routine one-man patrol that April afternoon in the desert about an hour’s drive south of downtown Phoenix and 85 miles from the Mexican border. The 53-year-old officer said he was on a hill south of Interstate 8 when he spotted five or six men (Latino or Native American, he wasn’t sure) walking north on a dirt trail below him. He said all but one were lugging large backpacks that he suspected held marijuana but that he hadn’t seen any weapons as they passed by. Puroll said he kept a safe distance as he followed the crew north for more than a mile across the rugged mountainous terrain. He said he stopped for a few minutes as the smugglers disappeared from sight over a ridge near Antelope Peak. The search-and-rescue deputy said he, too, then stepped over the rise. He knew from experience what was on the other side: a narrow, downhill wash dominated by shady mesquite trees and heaps of trash left behind by passersby — most of them undocumented. Immediately after Puroll crested the ridge, he said, he ran smack into the guys he was tailing. He said one of the men shot at him from about 25 yards “directly in front of me” with a powerful AK-47 assault rifle. That first shot, Puroll said, grazed his left flank a few inches above a kidney. The deputy avoided further injury and retreated to safety, he said, after several more shots by a second smuggler missed their mark. Puroll called 911 from his cell phone at 4:04 p.m. Seven more shots rang out in rapid succession before the deputy said a word to the dispatcher. Puroll immediately gave his GPS location, apparently reading from a handheld device. He then yelled, “Triple 9s!” the universal police code for an officer in trouble and needing help. Dozens of police officers immediately headed toward the remote vicinity , and records show some arrived near the junction of I-8 and State Route 84 within about 20 minutes. The intensive manhunt would include about 200 cops from local, state, tribal, and federal agencies. Four helicopters began their search for the deputy and his assailants well within an hour. But the “smugglers” escaped apprehension, and the packs that supposedly were filled with dope also vanished with them. An Arizona Department of Public Safety chopper pilot airlifted Puroll out of the desert about 5:20 p.m., 80 minutes after the 911 call. The deputy was treated at the Casa Grande Regional Medical Center and released a few hours later. Two of the helicopters were equipped with night-vision technology that detects temperature differences of objects such as vehicles and people. Pilots continued in vain to search for the supposed attackers that night. Within a day, authorities had detained about 70 suspected illegal immigrants over an expanse far beyond the Vekol Valley. Pinal County authorities expressed hope that three “persons of interest” — undocumented aliens ensnared in the desert manhunt — would help break the case. But they didn’t, and the trio were turned over to immigration authorities for deportation. The timing of the desert shooting couldn’t have been better for Sheriff Babeu — “ironic,” one of his lieutenants says, tongue not in cheek. He soon emerged nationally as a more articulate, telegenic, and younger version of Maricopa County’s blustery Sheriff Joe Arpaio. Babeu became a Fox News regular, eager to discuss the perils of a porous border and an inadequate federal response to illegal immigration. That had been Babeu’s agenda well before Louie Puroll got into the mix, and it had won him a starring role last spring in U.S. Senator John McCain’s “You’re one of us” campaign advertisement. Now, the sheriff was able to add a heroic deputy to his increasingly visible storyline. 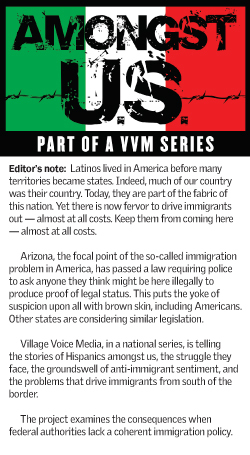 Babeu continues to claim that the “Mexican drug cartels” are running rampant in sections of his sprawling 5,400-square-mile jurisdiction, including the Vekol Valley. “We still are outgunned, we are outmanned, and we don’t have the resources yet to fight this,” he tells New Times. Shortly after the Puroll incident, the sheriff had to weather a media squall that began with a blog post on www.phoenixnewtimes.com in which police officers questioned the deputy’s account (“Sheriff’s Deputy Shooting . . . Has Some Local Cops Scratching Their Heads,” May 3). Babeu held a press conference on May 4 in Casa Grande. His presentation included close-up photos of Puroll’s gunshot wound and selected audio snippets of his communications with 911 dispatchers after the incident. “Tell my wife I love her,” the deputy said in one sound bite that would be replayed repeatedly on national news shows. A dispatch supervisor told the news media, “You can hear bullets ricochet near the phone,” a reference to that seven-shot burst of gunfire at the start of Puroll’s “I’ve been hit!” call. She was suggesting that the bullets were fired at the deputy moments before he spoke up during the 911 call. • That Puroll faced at least 30 rounds of gunfire during the shoot-out. He didn’t. • That more than one helicopter had come under fire in the desert before Puroll was rescued. None had. • That the smugglers left behind “bales” of marijuana as they fled. Authorities confiscated no contraband. A few weeks later, Babeu awarded Louis Puroll his agency’s Purple Heart medal before an Arizona Diamondbacks game in downtown Phoenix. McCain was there to shake the deputy’s hand. Little has been written or aired about Louie Puroll since the sheriff’s press conference. But New Times has continued to examine the case, utilizing some of the best forensic minds in the country to assist in a four-month investigation. The newspaper also analyzed reports filed by the DPS (which investigated the “crime scene”) and the Pinal County Sheriff’s Office. The odds that Louie Puroll is telling the truth about what happened to him on April 30 are slim. Add to that a criminal investigation by Pinal County sheriff’s detectives that was seemingly designed solely to clear their colleague Puroll. But others interpret the facts quite differently from Hausman. Puroll said in his May 3 interview with investigators that he was shot from about 25 yards away, not point-blank range. Dr. Werner Spitz, co-author of the textbook Medicolegal Investigation of Death and the retired chief medical examiner of Detroit’s Wayne County, agrees with Baden. ”This is a grazing wound fired at contact range,” Spitz tells New Times. But the equally esteemed Dr. Vincent Di Maio — author of the textbooks Handbook of Forensic Pathology and Gunshot Wounds and retired chief medical examiner of San Antonio’s Bexar County — says he isn’t sure how far away the shot was fired, largely because Pinal County’s investigation was inadequate. Di Maio says he is “very suspicious” of the reddish discoloration visible around Puroll’s wound. Such discoloration often is present with contact wounds and is caused by carbon monoxide-laden gases that emanate from firearms during discharge. He is referring to Puroll’s bloody T-shirt and what he suspected would have been testing for telltale gunpowder, soot, and other residue. Pinal County’s investigators, however, chose not to send the shirt to the DPS’ crime lab for analysis. ”I know you want to see if there’s stippling [gunpowder patterns] on it to eliminate or prove it was a close-range shot, and that’s legitimate,” Sergeant Hausman tells New Times of the testing question. Phil Keen, Maricopa County’s former chief medical examiner, says he doesn’t necessarily agree with the “contact wound” opinions rendered by Drs. Baden and Spitz. Keen says the wounding shot may have been fired from the distance the deputy suggested but adds that the results of T-shirt testing and other investigative findings could change his mind. ”The difficulty is the inability to view the clothing in person or even see an official report of the clothing,” Keen says. It isn’t the job of a forensic pathologist to speculate why Puroll might lie about the circumstances of his shooting. But analyzing possible reasons for why people behave is part of what Scottsdale’s Steven Pitt does for a living. Dr. Pitt has been a consultant to law enforcement in many high-profile investigations, including the JonBenét Ramsey murder, the Columbine High massacre, and the case of Franklin Brown, a former Phoenix cop who faked his own shooting (“A Shot in the Dark,” March 2, 2002). • He was involved in an accidental shooting involving unknown parties and concocted a wild yarn to save face. Pitt lists one more possibility — that Puroll was in cahoots from the start with his agency’s upper echelon — but allows that the chances of that conspiracy theory holding up are small. Deputy Puroll did not consent to an interview for this story. Pinal County sheriff’s spokesman Tim Gaffney says his agency’s internal-affairs investigation is almost done and that Puroll wants to speak with the news media after his supervisors review the report and his attorney gives the go-ahead. Louie Puroll’s path to his current position as a search-and-rescue deputy in Pinal County began in his native Michigan. It included tours of duty in the U.S. Army (he was a radio operator) and National Guard, and stints as a Texas cop and ranch foreman. Puroll has been with the Pinal County Sheriff’s Office for 14 years, first as a detention officer and now as a deputy. He has been a range deputy for about a decade, and his code name is “SAR 1,” short for search-and-rescue. Portions of Puroll’s personnel file, which the agency provided to New Times (missing was his employment history), include commendations after praise from citizens, and a few criticisms from his superiors. The statement couldn’t be vaguer, but it does get a point across. Puroll’s supervisor, Sergeant Brian Messing, has given him top grades for knowing how to rescue people — many illegal immigrants included — from potentially deadly situations in the unforgiving Pinal County desert that he knows so well. But Messing also has given the deputy subpar ratings regarding how he interacts with other police agencies — and on how he occasionally has treated victims, witnesses, and suspects. Bruce Peterson, a Mesa Community College professor, says he met Puroll in 2005 when the deputy led a team into the Superstition Mountains to rescue him from dehydration. The following year, Puroll joined the professor on a student expedition back into the area. Louie Puroll first checked in with dispatch at 8:57 on the morning of April 30. The deputy drove his unmarked Chevy Tahoe SUV to work, ate breakfast at a restaurant in Arizona City, and then headed in the early afternoon toward the Vekol Valley, about 20 miles west. By Puroll’s account, he drove his four-wheel-drive Tahoe south into the desert at Double Gates Road, at the border of Pinal and Maricopa counties. It is at milepost 151 on I-8. His supervisor, Sergeant Messing, was off that day. But Puroll apparently didn’t inform anyone else in authority of his plans to patrol an untamed area that his sheriff has likened to a war zone. He negotiated the bumpy, curvy dirt road for about four miles until he reached the end, and then parked his vehicle. Then he walked north for about two miles before perching above a well-traveled dirt trail that leads to the interstate. The weather was moderate; the high temperature that day was just 70 degrees. At 1:45 p.m., Puroll called a police dispatcher on his cell phone. Puroll was wearing khakis, a dark green T-shirt (he either was wearing a heavy long-sleeved shirt or carrying it around his backpack), a floppy hat, and combat boots. He said later his Camelbak backpack held a blanket, water, a first-aid kit, and other survival items. The deputy was carrying an M-16 rifle in a sling and had a Glock handgun in a holster. He also had a handheld GPS device, a new BlackBerry phone, binoculars, and extra ammunition. All that immediately identified Puroll as a peace officer was his Pinal County sheriff’s badge, which may or may not have been visible on his belt. What he didn’t have in this “war zone” was a bulletproof vest or police radio, just his cell phone. ”We were switching out our old radios for new and better ones,” Pinal County sheriff’s Lieutenant Tamatha Villar explained later. The GPS location Puroll gave at 1:45 p.m. was a mile and a quarter southeast of the coordinates he would give a dispatcher at 4:04 p.m., just after he said he was shot. Puroll was incommunicado for two hours after the 1:45 call — at least, his cell records show no activity during that time. At 3:42, he again called in. She said she could and that it showed he was near the frontage road parallel to I-8. ”Look, I’m about eight miles south of the frontage road,” the deputy said, sounding testy. ”Are you okay?” the dispatcher asked calmly. The dispatcher reconnected with Puroll within a few minutes. ”Listen to me,” he told her. “I’m in the saddle [a mountain pass] south of the truck stop. I’m following five or six individuals. Big backpacks full of dope. I’m a couple of hundred yards back. They have not seen me. This is where memories and evidence diverge. ”He says, ‘Hey, I’ve got these backpackers. They’re loaded. They’ve got dope, they’re northbound, and this is where I’m at.’ I said, okay, I’ll get guys started out there, and he said, ‘You know the area we’re talking about.’ He meant that if I called Joe Deputy out there, they’d have no idea how to get there or have the equipment. Why, Messing is asked, would Deputy Puroll call an off-duty supervisor and not someone closer to the scene and on duty? Messing becomes emotional as he continues with his recollections of April 30. Verizon cell phone records (and Puroll’s interview with investigators) suggest that Messing and the deputy didn’t speak that day until 4:04 p.m., when the deputy says he was shot. The records do show that a dispatcher contacted Messing at 3:50 p.m., shortly after she had spoken with Puroll. The deputy spoke with a dispatcher again just after 4 p.m.
How the deputy knew that the smugglers were “resting” over a ridge a few hundred yards ahead of him is uncertain. And why he waited just a few minutes before moving over that same ridge into a known stopping point for undocumented aliens — alleged drug smugglers, in this instance — is another question. Verizon records show that Brian Messing finally did contact Puroll at 4:04 p.m.
Puroll dialed 911 seconds later. Those 36 seconds — the “I’ve been hit!” call — later would be played across the nation and around the world. Some of what transpired in the chaotic minutes after Deputy Puroll’s 911 call is retraceable through dispatch recordings, reports, and interviews. Sergeant Messing took almost two minutes — an eternity under the circumstances — to call in after he and Puroll got disconnected. ”I was talking to Louie and I started losing him and it started like shots being fired,” he told the dispatcher. She calmly told Messing that they were on it. At 4:08 p.m., Puroll again got through to dispatch. ”I had to move,” he said, speaking loudly. Where have you been hit, the dispatcher asked him. ”Left side above my belt. I don’t have time to look at it. AK-47 rounds. There’s at least three of them with AK’s, maybe more. I can’t tell. I’m gonna shut up so they don’t hear me. You got my [GPS] position, so get here!” the deputy replied. ”Here” was more than three miles from the Vija Truck Stop on I-8 and more than four miles to Double Gates Road (from where Puroll had driven into the desert). Afterward, Pinal County Chief Deputy Steve Henry insisted to the news media that Puroll’s would-be killers could have escaped in a “nearby” vehicle before law enforcement began to arrive en masse. But it takes an average person 15 to 20 minutes to walk a mile, even without having to carry a heavy backpack up and down mountainous terrain. GPS calculations by New Times show that the distance south from the shooting site to the closest dirt road passable by car (near the deputy’s vehicle) is about three miles, which would take at least 45 minutes to travel on foot. It would have taken the smugglers about another 15 minutes by vehicle over the treacherous dirt road to I-8. The escape to the interstate within 30 minutes of “I’ve been hit!” call would have taken about an hour. If the smugglers had, instead, continued to walk north after shooting Puroll, it would have taken them about 20 minutes on foot to get to a different dirt road drivable by vehicle. (New Times walked from this road to the scene in about 20 minutes, not toting a heavy backpack). Then it would have taken them another 20 minutes to get to the rear of the Vija Truck Stop at I-8 and State Route 347 — about 40 minutes in all. Certainly, the situation initially was fluid. “There were so many cops it was like an FOP [Fraternal Order of Police] convention out there,” Sergeant Hausman recalls. But what was the likelihood of six smugglers (with at least two would-be cop killers in the bunch) slithering away from the police in broad daylight with their cache of marijuana? By about 5 p.m., the Pinal County Sheriff’s Office set up a makeshift command post just off I-8 near Double Gates Road. Puroll was on his cell phone almost constantly until the helicopter picked him up, conversing with Sergeant Messing several times. Puroll was somewhere south of the shooting site, but apparently some distance from where he had parked his Tahoe hours earlier. ”Getting shot ain’t no fun at all,” he told a dispatcher at one point. The dispatcher asked him what was going on. The deputy then hung up. The DPS helicopter pilot lifted Puroll out of the desert about 5:20 and took him to the command post. Puroll spoke there with Sheriff Babeu before an ambulance took him to the Casa Grande Regional Medical Center for treatment. Pinal County deputies found the apparent shooting site near Antelope Peak before nightfall. It was familiar to the deputies who work search-and-rescue, a final resting stop for untold undocumented immigrants before they walk the last few miles to I-8 on their way to Phoenix. The site is an environmental disaster, with literally hundreds of plastic water bottles, ratty old backpacks, tattered clothing, the remnants of Mexican pharmaceuticals, blankets, and other rolls of toilet paper. The officers eyed lots of ammunition, both expended and unexpended, in the “bottleneck,” including dozens of shell casings clustered near the top of the ridge. They also saw a Glock handgun near the spent casings. It was Louie Puroll’s — he had left it behind. The deputies retreated to the command center by helicopter before it got too dark. Sheriff Babeu and his top staff (accompanied by a senior prosecutor from the Pinal County Attorney’s Office) decided to ask the DPS to process the scene the next morning. Pinal County would keep the officer-involved shooting and internal-affairs investigations in-house. Sheriff’s personnel photographed Deputy Puroll’s gunshot wound at the hospital. The photos later served as the basis for the expert opinions of the pathologists contacted by New Times. The police also took photos of Puroll’s bloody T-shirt and of several other evidentiary items, including the deputy’s firearms. DPS investigators wanted to speak with the deputy that night, but Puroll already had been released from the hospital by the time a detective got there. DPS and Pinal County investigators returned to the desert shooting site by helicopter the next morning. The state cops canvassed the clutter, taking hundreds of photographs and noting the GPS coordinates of the evidence they collected. They recovered the Glock left behind by the deputy and, a few feet from the gun, the GPS unit and other items belonging to the deputy. Forty-six shell casings from Puroll’s two guns — the Glock and the M-16 — were nearby. The presence of the casings suggested that he had discharged his weapons from the GPS location he shouted out at the start of his “I’ve been hit!” call. Six of the casings came from AK-47 rifles (though it hasn’t been determined whether they were from the same gun), and three came from a .45-caliber handgun. Two of the AK-47 cartridges were within a few feet of the casings from Puroll’s guns, but they were badly rusted and practically embedded into the ground. The other four AK-47 casings appeared newer. According to GPS calculations, they were close to each other, about 35 yards downhill from the deputy’s Glock. But, importantly, they were not in the general area where the deputy claimed that he had been fired upon by the first shooter. Three .45-caliber casings were another 18 yards behind and to the left of the four AK-47 cartridges, looking downhill from Puroll’s perspective. By May 3 (three days after the shooting), Louie Puroll — reportedly a victim of attempted murder — obtained the counsel of a Casa Grande attorney who represents the Pinal County Deputies Association. That morning, two investigators from Pinal County and two more from the DPS planned to return to the desert with Deputy Puroll for a walk-through of the shooting scene. Investigators would be limited to asking about where Puroll was standing when he was shot and when he was shooting, the directions he shot, and where the men were when he shot at them. One more thing: The walk-through couldn’t be audio- or videotaped. Remarkably, both police agencies agreed to the attorney’s stipulations. Pinal County Sergeant Hausman and case agent Todd Nelson got their chances to speak with Deputy Puroll (with attorney Fitzgibbons present) later that day back at the main station. Police detectives utilize various techniques when interviewing suspects, witnesses, and victims. Some let the subject tell a story with little interruption before circling back to dissect the story detail by detail. Puroll spoke deliberately during the 47-minute interview, sounding at times as if he were telling a mesmerizing war story around a campfire. The two Pinal County detectives listened to their colleague for 26 minutes straight at one point, as the list of obvious follow-up questions mounted. But neither Sergeant Hausman nor Detective Nelson would challenge any part of the dramatic monologue. Puroll said he then decided to step over the rise, after he reset his M-16 rifle to fully automatic, turning it into a machine gun. He said his sergeant, Messing, then called him. It was 4:04 p.m.
”And as he said that, a man stood up in front of me about 25 yards away. I had my cell phone in my right hand and my GPS in my left hand. I had just read my GPS location to the dispatcher, and I still had everything in my hand, and that guy stood up in front of me. Puroll said he dropped to the ground, as more rounds whizzed over his head. He said he emptied his rifle while he was sitting there and then laid that weapon on the ground and drew his pistol. The deputy’s statement about the backpack raises questions about how, when, where, and, specifically, why Deputy Puroll took it off his back. Puroll described how shots continued to sail over his head as he retreated about 50 yards and moved off the dirt trail. It was only then, the deputy insisted, that he made his “I’ve been hit!” call to dispatch. Investigators found no signs of blood at the shooting scene and recovered no bodies from the area. Sergeant Hausman had but one question of the deputy at the end of the interview — about the first shooter’s intent. ”He was intending to kill me,” Puroll replied. Sergeant Brian Messing is standing on a dirt road in the Vekol Valley, a few yards from where Deputy Puroll parked his SUV on April 30. At dawn, Messing and a county SWAT team, along with case investigators Hausman and Nelson, had led a New Times reporter to the shooting site near Antelope Peak. Everyone but the sergeant and the reporter left the area after returning to the Vija Truck Stop a few hours later. Messing tries to explain himself and his role in this complicated and significant case. The sergeant says he did not write a police report of his role as a possible “ear-witness” to the shooting because no one asked him to. And he notes that criminal investigators didn’t interview him until almost three months after the incident. It has gotten that bad. In early June, a drug smuggler called 911 after he and a friend were shot in the Vekol Valley. The caller told a dispatcher in Spanish that he had been shot “right here where they shot the sheriff,” a comment that Babeu says, in a sense, corroborates Puroll’s tale. Puroll, he says, is back on the job, though Babeu doesn’t allow range deputies on solo patrols anymore. Drs. Baden, Spitz, and Di Maio independently examined the photos taken of Puroll’s gunshot wound before replying to New Times. ”There is black powder along the edges of the [wound], a furrow along the edges,” says Baden, who also is the chief forensics consultant to Fox News and, thereby, one of the more visible forensic pathologists in the nation. But he says he’s not comfortable with rendering a definitive opinion. Retired homicide cop Weaver Barkman says Louie Puroll’s story doesn’t work on a number of levels.